If you’re looking for the best hydronic heaters Melbourne has to offer, rely on Geo Climate. We have over 20 years of experience in hydronic heating design, installation and servicing. What exactly is hydronic heating? Put simply, hydronic heating uses hot water to transfer heat – it does this by using a boiler or pump which heats up water, circulating it through your home to provide you with a highly comfortable and natural form of heating. This heating can come in the form of radiator panels, towel rails or the highly popular floor heating. Best of all, this is a silent, radiant heat that doesn’t rely on blowing hot air; this means you won’t be spreading dust and allergens. Hydronic heating systems are installed during the construction phase or can be retrofitted to existing buildings. Hydronic Heating Systems Melbourne - What are the benefits? A properly designed hydronic system is comfortable and non intrusive. With relatively few moving parts hydronic heating is virtually silent within the house. A hydronic system will ordinarily serve 25 years or more, both because of the material used and the minimum number of moving parts. There is no one temperature that is comfortable at all times. A hydronic system can be installed with independent temperature controls known as zones for any area of your home, or specific rooms,that work automatically. bedrooms can be kept cool for a restful sleep, while bathrooms are warm for a comfortable morning shower. The heat source for your hydronic heating system can come from a number of options, including gas boiler, heat pump, geo-exchange, active solar, solid fuel or oil burner. The water heated by the boiler is circulated throughout the building to either radiator panels, floor coil, towel warmers, or fan coil units. 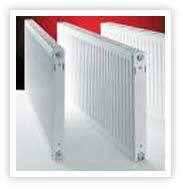 Radiator Panels work by heating the air which flows past them. Warm air rises from the radiators and colder air in the room falls. This circulation develops a flow of air around the room sending warm air from the radiator and delivering cooler air back to be heated. So, for radiators to work well there must be adequate clearance around them so that air flow isn't restricted. Hydronic Slab Underfloor Heating – Melbourne’s Best! Hydronic underfloor slab heating is one of the oldest – and highest regarded – methods of central heating. It works by circulating warm water through a series of pipes laid out in loops, embedded in a concrete slab. The surface area gently radiates heat upwards into the room. It works for just about any type of floor covering including tiles, stone and marble – specific timber flooring can be used. Low water temperature heating ideal for condensing boilers and heat pumps. Programmers add even more flexibility and economy to your hydronic heating system, allowing you to set when the hot water turns on and off. Installing a programmer will only save you energy and money down the track. Programmable room thermostats allow you to choose the times you want your home to be heated and the exact temperature for it to reach. This means different areas of your home can have varied temperatures during the week. So if you’re looking for the best hydronic heating systems Melbourne has to offer, rely on Geo Climate – we’re experts with hydronic heating installation, repairs and servicing! Copyright © 2015 Geo Climate Systems. All rights reserved.